1 Recognized by the Great Council of Chiefs. Fiji, officially the Republic of the Fiji Islands, is an island nation in the South Pacific Ocean, east of Vanuatu, west of Tonga and south of Tuvalu. Pronounced “Fee-jee,” the country occupies an archipelago of about 322 islands, of which 106 are permanently inhabited. There are also 522 islets. The two major islands, Viti Levu and Vanua Levu, account for 87 percent of the total population. The name Fiji is the old Tongan word for the islands, which is in turn derived from the Fijian language name "Viti." In the Second World War, the people of Fiji co-operated with the Allies, allowing the construction of an air base on Nadi. In recent years, Fiji has sent its troops on United Nations peace-keeping missions. Domestically, a racial, religious and cultural split between Indo-Fijians and Melanesian-Polynesian Fijians, a legacy of British colonial times when thousands of indentured laborers were brought from India to work the sugar plantations, remains a stumbling block to political harmony. Fiji is a group of volcanic islands in the South Pacific Ocean, lying about 2,765 miles (4,450 km) southwest of Hawaii. Viti Levu, the largest island, covers about 57 percent of the nation's land area, hosts the capital Suva, Lautoka, and most other major towns, such as Ba, Nasinu, and Nadi (the site of the international airport), and holds roughly 69 percent of the population. Vanua Levu, 40 miles (64 km) to the north of Viti Levu, covers over 30 percent of the land area and is home to 15 percent of the population. Its main towns are Labasa and Savusavu. Both islands are mountainous, with peaks up to 4,265 feet (1,300 meters) rising abruptly from the shore, and covered with tropical forests. Heavy rains (up to 120 inches/year, or 304 cm) fall on the windward (southeastern) side, resulting in dense tropical forest. Lowlands on the west of each of the main islands are sheltered by the mountains and have a reliable dry season favorable to crops like sugarcane. Other islands and island groups include Taveuni and Kadavu (the third and fourth largest islands respectively), the Mamanuca Islands (just outside Nadi) and Yasawa Islands (to the north of the Mamanucas), which are popular tourist destinations, the Lomaiviti Group, outside of Suva, and the remote Lau Islands. 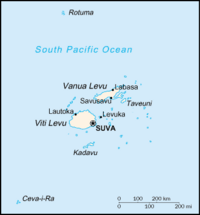 Levuka, Fiji's old capital, is on the island of Ovalau. Rotuma, some 310 miles (500 km) north of the archipelago, has a special administrative status in Fiji. More than half of Fiji's population lives on the island coasts. The rugged interior is sparsely populated. The total land area is 7,054 square miles (18,270 square kilometers), which is slightly smaller than New Jersey. It has a tropical marine climate with only slight seasonal temperature variation. The highest point is Tomanivi, at 4,344 feet (1,324 m). Cyclonic storms can occur from November to January. The major environmental issues facing Fiji are deforestation and soil erosion. 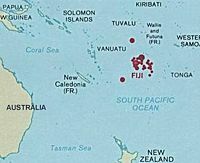 The first inhabitants of Fiji arrived from Southeast Asia. In 1500 B.C.E., Fiji was settled by Polynesian seafarers. From 500 B.C.E., Melanesian seafarers reached Fiji and intermarried with the Polynesian inhabitants, giving rise to the modern Fijian people. The earliest documented Eurupean encounter was the visit by the Dutch explorer Abel Tasman in 1643 C.E., attempting to find the Great Southern Continent. British explorer Captain James Cook visited Vatoa, in the southern Lau archipelago, in 1774. 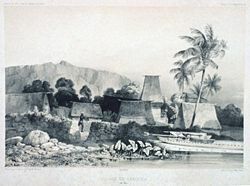 The first permanent European settlement began in 1822, at Levuka, Fiji's first modern town with Christian missionaries from Tahiti arriving in southern Lau. In 1871, the Kingdom of Fiji was established as a constitutional monarchy, with Cakobau as king, but with real power in the hands of a cabinet and legislature dominated by settlers from Australia. The islands came under British control as a colony in 1874. In 1876, the Great Council of Chiefs was established. In May, 1879, 463 indentured laborers arrived from India—the first of some 61,000 to come over the following 37 years. In 1881 the first large sugar mill was built at Nausori. Wealthy Indians were enfranchised for the first time in 1929, when elected Indian representation in the Legislative Council was begun. Indigenous Fijians and women were enfranchised in 1963. Responsible government was instituted in 1967. Ratu Kamisese Mara was appointed first Chief Minister. Fiji was granted independence in 1970. Ratu Mara's Fijian Alliance Party won the first post-independence election in 1972. In 1973, the sugar industry was nationalized. A constitutional crisis erupted in 1977 in which Governor-General Ratu Sir George Cakobau overturned election results following the failure of the winning National Federation Party to put together a government. A second election, held in September of that year, resulted in a landslide for the Alliance Party. The Fiji Labour Party won the elections of 1987. Timoci Bavadra became Prime Minister for a month, until, on May 14, Lieutenant Colonel Sitiveni Rabuka carried out a coup, followed by a second coup on September 25. On October 7, Rabuka proclaimed a republic, severing the 113-year link to the British Monarchy. Fiji was expelled from the Commonwealth of Nations. On December 5 of that year, Rabuka appointed Ratu Sir Penaia Ganilau as Fiji's first president. A 1990 constitution guaranteed ethnic Fijian control, and led to heavy Indian out-migration. The population loss brought economic difficulties, but ensured that Melanesians became the majority. After the 1992 elections, held under the new constitution, Rabuka became prime minister. Amendments enacted in 1997 made the constitution more equitable. Free and peaceful elections in 1999 resulted in a government led by Mahendra Chaudhry, an Indo-Fijian. A year later, this government was deposed in a coup led by George Speight, a hardline Fijian nationalist. Fiji's membership of the Commonwealth of Nations was suspended due to anti-democratic activities connected with the 2000 coup. Democracy was restored towards the end of 2000, and Laisenia Qarase, who had led an interim government, was elected prime minister. Fiji was readmitted to the Commonwealth in 2001. But on December 5, 2006, Commodore Bainimarama executed Fiji’s fourth coup in 20 years, and declared himself acting president. Plans by the Qarase government for a Reconciliation and Unity Commission with power to recommend compensation for victims of the 2000 coup, and amnesty for its perpetrators, prompted the latest coup. The Spanish flu pandemic of 1918 killed 14 percent of the Fiji population within sixteen days. Fiji's head of state is the president. He is elected by the Great Council of Chiefs, in consultation with the prime minister, for a five-year term. Although his role is largely honorary, modeled on the British monarchy, the president has certain "reserve powers" that may be used in the event of a national crisis. Actual executive power is in the hands of the cabinet, presided over by the prime minister. The cabinet, consisting of ten to 25 ministers, is appointed by the president on their nomination by the prime minister. Every party holding more than eight seats in the house entitled to proportionate representation in the cabinet. Fiji's legislature, Parliament, consists of two houses. The more powerful House of Representatives has 71 members, elected for five-year terms. Twenty-five are elected by universal suffrage. The remaining 46 are reserved for Fiji's ethnic communities and are elected from communal electoral rolls: 23 Fijians, 19 Indo-Fijians, one Rotuman, and three "general electors" (Europeans, Chinese, and other minorities). Fiji maintains an independent judiciary, with judicial power vested in three courts, the High Court, Court of Appeal, and Supreme Court. Fiji is organized into four divisions, which are further subdivided into 14 provinces. The island of Rotuma is a dependency. Municipal governments, with city and town councils presided over by mayors, have been established in Suva, Lautoka, and ten other towns. There are separate councils to deal with matters affecting ethnic Fijians. The 55-member Great Council of Chiefs includes three representatives from each of Fiji's 14 provinces and one dependency, three ex-officio members (the president, vice-president, and prime minister), and six government appointees. The Great Council of Chiefs advises the government, and functions as an electoral college to appoint the President of the Republic, as well as 14 of the 32 senators. Land tenure remains a contentious issue. In 1909 near the peak of the inflow of indentured Indian laborers, the sale of land was prohibited. Today over 80 percent of the land is held by indigenous Fijians, under the collective ownership of the traditional Fijian clans. Indo-Fijians produce over 90 percent of the sugar crop but must lease the land they work from its ethnic Fijian owners. The leases are for 10 years, and are usually renewed for two 10-year extensions. Indo-Fijians have pressed for renewable 30-year leases. The Indo-Fijian parties' major voting bloc is made up of sugarcane farmers, nonetheless, these farmers' primary source of power has been their ability to organize widespread boycotts of the sugar industry, thereby crippling the economy. Fiji, endowed with forest, mineral, and fishery resources, has one of the most developed of the Pacific Island economies, despite its large subsistence sector. Sugar exports, remittances from Fijians working abroad, and a growing tourist industry—with 300,000 to 400,000 tourists annually—are the major sources of foreign exchange. Fiji's sugar export has special access to European Union markets, but will be harmed by the EU's decision to cut sugar subsidies. Sugar processing makes up one-third of Fiji's industrial activity but is not efficient. Long-term problems include low investment, uncertain land ownership rights, and the government's ability to manage its budget. Overseas remittances from Fijians working in Kuwait and Iraq have increased significantly. The political turmoil in Fiji has had a severe impact on the economy, which shrank by 2.8 percent in 2000 and grew by only one percent in 2001. The tourism sector recovered quickly, however, with visitor arrivals reaching pre-coup levels during 2002; this has helped create a modest economic recovery. Exports totaled U.S. $862 million in 2004. Exported commodities included sugar, garments, gold, timber, fish, molasses and coconut oil. Export partners were the United States (23.5 percent), Australia (18.6 percent), United Kingdom (12.3 percent), Samoa (6.3 percent), and Japan (4 percent). Imports totaled U.S. $1.235 billion in 2004. Imported commodities included manufactured goods, machinery and transport equipment, petroleum products, food, and chemicals. Import partners were Australia (25.9 percent), Singapore (23.1 percent), and New Zealand (21.1 percent). Until recently, the tallest building in Fiji was the 14-story Reserve Bank of Fiji Building in Suva, which opened in 1984. In November 2005, the 17-story Suva Central commercial center became the tallest building in Fiji. The population of Fiji, estimated at 848,000, is mostly made up of native Fijian people, a people of mixed Polynesian and Melanesian ancestry (54.3 percent), and Indo-Fijians (38.1 percent), descendants of Indian contract laborers brought to the islands by the British in the nineteenth century. The percentage of those of Indian descent has declined over the past two decades because of emigration. About 1.2 percent are Rotumadash, natives of Rotuma Island, whose culture has more in common with Tonga or Samoa. There are also small but economically significant groups of Europeans, Chinese, and other minorities. Relationships between ethnic Fijians and Indo-Fijians have often been strained. There are three official languages: English, introduced by the former British colonial rulers; Fijian language, spoken by ethnic Fijians; and Hindustani, the main language spoken by Indo-Fijians. Citizens of Fiji have the constitutional right to communicate with any government agency in any of the official languages, with an interpreter to be supplied on request. English is widely spoken by both ethnic Fijians and Indo-Fijians. It is the language in which the government conducts most of its business, and is the main language of education, commerce, and the courts. Fijian belongs to the Austronesian family of languages and is closely related to the Polynesian languages, such as Tongan. There are many dialects, but the official standard is the Bau dialect, from the most politically and militarily powerful of the many indigenous kingdoms of the nineteenth century. Fijian Hindustani is derived from one of the eastern forms of Hindustani, called Awadhi. It has developed unique features that distinguish it from the Awadhi spoken on the Indian subcontinent and is spoken by nearly the entire Indo-Fijian community. Rotuman language is more closely related to the Polynesian languages than to Fijian. Among the Indo-Fijian community, there is a small Gujarati-speaking community, and a few older Indo-Fijians still speak Telugu language and Tamil, with smaller numbers of Bihari, Bengali, and others. Religion is one of the fault lines between indigenous Fijians and Indo-Fijians, with the former overwhelmingly Christian (99.2 percent at the 1996 census), and the latter mostly Hindu (76.7 percent) or Muslim (15.9 percent). The largest Christian denomination is the Methodist Church. With 36.2 percent of the total population (including almost two-thirds of ethnic Fijians), its share of the population is higher in Fiji than in any other nation. Roman Catholics (8.9 percent), the Assemblies of God (4 percent), and Seventh-day Adventists (2.9 percent) are also significant. Christians of all kinds comprise 6.1 percent of the Indo-Fijian population. Hindus belong mostly to the Sanatan sect (74.3 percent of all Hindus) or else are unspecified (22 percent). The small Arya Samaj sect claims the membership of some 3.7 percent of all Hindus in Fiji. Muslims are mostly Sunni (59.7 percent) or unspecified (36.7 percent), with an Ahmadiya minority (3.6 percent) regarded as heretical by more orthodox Muslims. Fijian society is communal, with great importance attached to the family unit, the village, and the vanua (land). A hierarchy of chiefs presides over villages, clans, and tribes. Chiefly positions are hereditary; a deceased chief is invariably followed by a kinsman, though not necessarily his own son. This reflects Polynesian influence; in most other Melanesian societies, chiefs are appointed on merit. The largest social unit is the yavusa, defined as the direct descendants of a single kalou-vu (deified ancestor), who supposedly arrived with the legendary Lutunasobasoba migration. Chiefly succession was from older brother to younger brother, after the death of their father. When the youngest brother died, the eldest son of the eldest brother became chief. There is more of a tendency nowadays towards primogeniture. Each brother in the family then formed his own branch of the yavusa, called the mataqali. Each mataqali became the custodian of a specific task. A fully developed yavusa has several mataqali: the turaga, who descend from the original ancestor through primogeniture; the sauturaga, who are next in rank to the chiefs; the mata ni vanua, the official heralds of the village, who are in charge of ceremonial functions; the bete, the traditional priestly class (the kalou-vu was believed to speak through the bete); and the bati, the traditional warrior class. The mataqali are subdivided into tokatoka, each comprising closely related families. Several yavusa comprise a village, several of which form a district. The British colonial rulers amalgamated the districts into yasana, or provinces. The districts also form three matanitu, or "confederacies." The Kubuna Confederacy, which covers Tailevu, Bau, and Verata, on the southeast side of the main island of Viti Levu, is considered to be the most senior. The other two are Burebasaga (covering the rest of Viti Levu), and Tovata, covering Vanua Levu, the Lau Islands, and the Lomaiviti archipelago. Tovata has been politically dominant since Fiji gained its independence in 1970. An indigenous art form is the meke, a kind of spiritual folk dance, in which dancers' bodies are said to be possessed by spirits. These dances include the seasea (women's fan dance) or the make wesi (men's spear dance) and is usually a narrative of an important event. Some mekes are generations old, and form an important part of Fiji's oral history. Fijian folk-music styles are unique in their fusion of Polynesian and Melanesian traditions. Folk music is dominated by vocal church music, as well as dances characterized by rich harmony and complex percussion made from slit drums or natural materials. Modern Fijians play mandolin, guitar, and ukulele along with a variety of indigenous instruments, most commonly lali drums. These drums were an important part of traditional culture, used as a form of communication to announce births, deaths, and wars. The traditional attire was loincloths for men and grass skirts for women. Skirts were short for single women, and long for married women, with girls wearing virgin locks before marriage. Most had the lower parts of their bodies decorated with tattoos. Chiefs dressed more elaborately. Modern Fiji's national dress is the sulu, which resembles a skirt. It is commonly worn by both men and women. Many are elaborately decorated with patterns and designs. Many men, especially in urban areas, also have sulus tailored as part of their suit. Many will wear a shirt with a western-style collar, tie, and jacket, with a matching sulu and sandals. Even the military uniforms have incorporated the sulu as part of ceremonial dress. Indigenous Fijian men rarely wear trousers. Women usually wear a multi-layered tapa cloth on formal occasions. A blouse made of cotton, silk, or satin, is often worn on top. On special occasions, women may wear a tapa sheath across the chest, rather than a blouse. On other occasions, women may be dressed in a chamba, also known as a sulu I ra, a sulu with a specially crafted top. Men of chiefly rank usually wear a piece of brown masi around their arms or their waist. Chiefs may also decorate their hair with sandalwood dust. Kava, known in Fiji as yaqona, is Fiji's national drink. Traditionally, it was used only in important ceremonies. Nowadays, it is a social beverage. There is a strict protocol associated with yaqona drinking. One should clap once, clasping the hands, take the cup, and drink the yaqona in a single mouthful, before returning the cup to the bearer, clapping three times, and saying the word maca (pronounced: maÞa). The lovo is an earth oven, a fire made on in a pit in the ground lined with stones. It closely resembles the hangi of the New Zealand Māori. When the stones are hot, food is buried in the pit and left to cook; the food is then dug up and eaten. Dishes cooked this way include palusami, parcels of taro leaves saturated with coconut oil, and filled with onions, and sometimes tinned meat. In the pre-Christian era, human sacrifice was practiced. Men were buried alive to hold the pillars to the house of a chief. Cannibalism was practiced, too: the bodies of enemies slain in battle, or in sacrifice, were piled up and cooked for festivals, such as the installation of chiefs. Seru Epenisa Cakobau, the Bau Island warlord who united the disparate tribes of Fiji and proclaimed himself king in 1871, renounced cannibalism on his conversion to Christianity in 1854. Rugby union is very popular in Fiji. The highest level of competition is the Colonial Cup. The Fiji national rugby union team competes in international tournaments. The Sawau tribe of Beqa are noted for their ability to walk on white hot stones without being burned. Strict rituals have to be observed before the firewalking ceremony. ↑ Dr. A. Tschentscher, LL.M.. Section 4 of Fiji Constitution. Servat.unibe.ch. Retrieved December 20, 2011. ↑ Department of Economic and Social Affairs Population Division (2009). World Population Prospects, Table A.1. Retrieved December 20, 2011. ↑ 3.0 3.1 3.2 3.3 Fiji. International Monetary Fund. Retrieved December 20, 2011. ↑ Timeanddate.com. Timeanddate.com. Retrieved December 20, 2011. 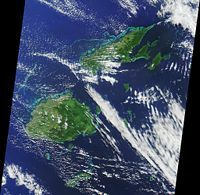 ↑ NASA, Republic of Fiji Retrieved December 20, 2011. All links retrieved April 10, 2017. Fiji, United States Department of State. This page was last modified on 10 April 2017, at 17:52.